Learning to use the potty takes patience and practice, and this charming, straightforward book helps pave the way. Young children learn how to use the potty and why it's time to do so, while gaining the courage and confidence to face this important milestone in their lives. 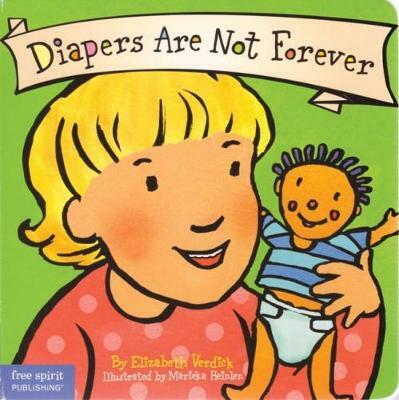 When little ones learn to "do what the big kids do" (go, wipe, flush, wash their hands), they won't need a diaper anymore--they'll have underwear under there! Includes tips for parents and caregivers from a children's health specialist. Elizabeth Verdick is the author of more than 30 highly acclaimed books for children and teenagers, including books in the Toddler Tools(TM) board book series, the Best Behavior(TM) series for young children, and the Laugh & Learn(TM) series for preteens. Her most recent titles include "Pacifiers Are Not Forever "and S"ee You Later, Procrastinator! "(with Pamela Espeland). Elizabeth lives with her husband, daughter, son, and five pets near St. Paul, Minnesota. Marieka Heinlen received her BFA at the University of Wisconsin, Madison, and also studied at Central Saint Martins College of Art and Design in London. She launched her career as a children's book illustrator with the award-winning "Hands Are Not for Hitting." As a freelance illustrator and designer, Marieka focuses her work on books and other materials for children, teens, parents, and teachers. She lives in St. Paul, Minnesota, with her husband and son.